Rush Sport & Entertainment continues to grow and enhance its long-term relationship with Marriott International, in particular its exciting new combined loyalty brand, Marriott Bonvoy™. Marriott Bonvoy™ announces the extension of its industry leading partnership with Formula 1 World Champions Mercedes AMG Petronas Motorsport this week ahead of the Formula 1 curtain raiser in Melbourne Australia. In support of the renewed partnership Rush Sport & Entertainment will continue providing Marriott International strategic consultancy and delivering tactical brand activations driving brand messaging and member engagement around the World including all Formula 1 markets. Marriott Bonvoy™ branding will feature prominently on the team, drivers and race cars whilst a programme of new and enhanced member experiences will ensure Marriott Bonvoy™ maintains its position of industry leader and brand of choice for over 110million travellers Worldwide. In addition the 2019 Formula 1 Rolex Australian Grand Prix will feature a high profile Marriott Bonvoy™ presence beyond support of Mercedes AMG Petronas Motorsport. Through the creation of the Marriott Bonvoy™ Lounge, the Australian GP and Marriott International have created a bespoke design and decor, topped with elite service and delicious food. Furthermore, all race fans will be able to take advantage of the Marriott Bonvoy™ Pit Stop at various locations around the race venue and use the Marriott Bonvoy™ buggies to get around more easily. Special experience packages have been developed for the event to ensure Marriott Bonvoy™ members have the opportunity to engage in a range of unique activities from hot laps, to helicopter rides, and meet and greets with the race drivers over the weekend. Melbourne 2019 will be an event to remember for Marriott Bonvoy™ and Rush Sport & Entertainment. Mahindra Racing has announced a partnership with Magneti Marelli to develop powertrain components for Mahindra Racing’s season three Formula E car, the M3Electro. 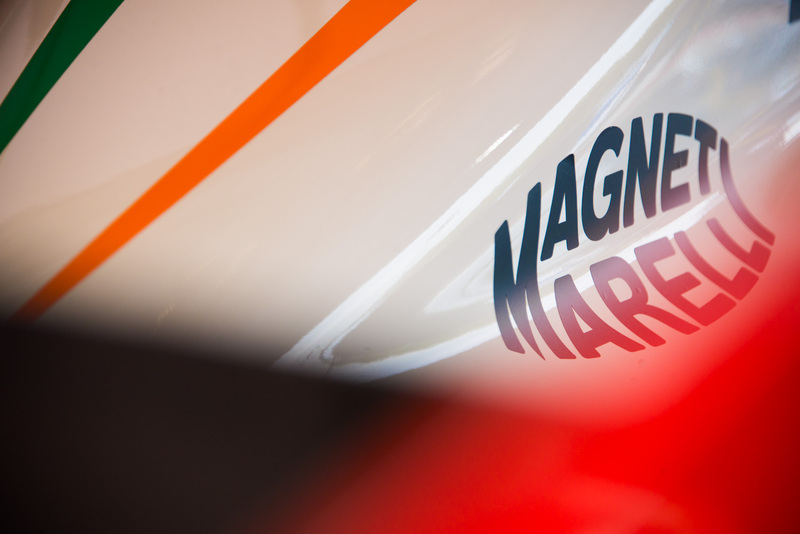 Mahindra Racing and Magneti Marelli will also begin a new commercial partnership, with the Italian supplier’s branding appearing on the season two M2Electro for the remaining races of the current season. Magneti Marelli, which currently provides technical support to multiple F1 teams for their energy-recovery systems, has developed specialized powertrain components targeting high levels of efficiency. The M2Electro will also be displayed on the Magneti Marelli stand at the upcoming Beijing Auto Show which takes place from the 25th of April until the 4th of May 2016 at the China International Exhibition Center, Beijing. Hong Kong-based auto racing agency Rush Sports Marketing has been appointed to represent upcoming tours by the Rolling Stones and Elton John. Rush was launched in September 2010 by its chief executive Tom Potter who was previously responsible for commercial alliances at the Williams Formula One team. It has quickly built up a valuable niche thanks to its specialism in the Asian market which is one of the biggest growth regions in F1. Just ten years ago only 12.5% of F1 races were in Asia compared to 42.1% last year. Rush has more experience in the Asian market than any other sponsorship agency in F1 and Mr Potter has used it to his advantage. He revealed to Forbes that the company has recently hit a landmark in the amount of sponsorship it has secured for clients. “Rush has so far brokered over $50 million (total contracted value) in sponsorship and licensing deals across 6 F1 teams, V8 Supercars, a Premiership football team and the Rolling Stones,” says Mr Potter adding that the value of the deals ranges from $450,000 to $10 million. At Williams Mr Potter worked with a suite of Fortune 500 brands including AT&T, Hewlett-Packard, the Royal Bank of Scotland, Philips, Thomson Reuters and PepsiCo. This feat was made all the more impressive by the fact that Williams is one of only four F1 teams which is not owned by a major corporation or a billionaire. Instead, 50.8% of its shares are owned by its founder Sir Frank Williams with 24.1% floated on the Frankfurt stock exchange and the remainder in the hands of other investors and management. Rush was built on this principle of applying business rigour to the decision-making process for sponsorship and setting at the outset key performance indicators to monitor its effectiveness. “There are two things that make us unique and different,” says Mr Potter. “The first is our approach. The focus of Rush is getting to know the brand’s business.” This is no idle boast as Rush takes a hands-on and thorough approach which even extends to interviewing key executives in the company which is seeking sponsorship. This helps Rush to identify the key performance indicators which the company sets to monitor the success of the sponsorship. “I believe that our process of identifying what your objectives and KPIs are from the outset and then tracking them through to an impact on the bottom line makes it much more tangible,” says Mr Potter. He adds that Rush’s objective is to apply to sponsorship decisions the same due diligence which is done on major financial investments. It differs to the emotional approach which often drives sponsorship deals and sees brands partnering with certain sports because the owner or chief executive are fans of them. When this happens, brands tend not to do research into the opportunity which in turn makes it harder for the commercial department to track the return on investment. “Especially during an economic downturn, a chief financial officer wants to know, just as they would if they were making an investment in a new factory or a new product, how many more units have been sold as a result of the sponsorship deal and has that affected our margin or the value of our business. So it is nice if you can go in and say that,” says Mr Potter. Mr Potter says that before he founded Rush he had identified Asia as an ideal base of operations but the opportunity to set up the company there was more of a coincidence.